Skydiver Felix Baumgartner planned to make a record-breaking supersonic jump from near the edge of space under the Red Bull Stratos. Here, he is seen performing one of several high-altitude training jumps on May 27, 2010 that reached 26,000 feet. A lawsuit on Earth has grounded plans by Red Bull energydrink to send an Austrian daredevil into the stratosphere in an attempt tobreak the world record for the highest skydive. The RedBull Stratos mission was slated to kick off some time this yearand fly skydiver Felix Baumgartner to 120,000 feet (36,576 meters)on a balloon,then ride along with cameras as he plunged? back to Earth at supersonic speeds. The idea was to break the recordset 50 years ago by retired U.S. Air Force Col. Joe Kittinger,who as a captain set the world's skydiving bar at 102,800 feet (31,333 meters)on Aug. 16, 1960. But a multimillion-dollar lawsuit against Red Bull byCalifornia promoter Daniel Hogan has stalled the project indefinitely. In a complaint filed in the Los Angeles Superior Court, Hoganclaims that the idea for the high-altitudeskydive was originally his, and that Red Bull passed on the concept when hepitched it to the company in 2004, according to Courthouse News. Red Bull officials called off the RedBull Stratos project this week because of the lawsuit, which hasbeen ongoing for months. "Despite the fact that many other people over thepast 50 years have tried to break Colonel (Ret.) Joe Kittinger's record, andthat other individuals have sought to work with Red Bull in an attempt to breakhis record, Mr. Hogan claims to own certain rights to the project and filed amultimillion-dollar lawsuit earlier this year in a Californian court," RedBull officials said on Oct. 12. "Due to the lawsuit, we have decided to stopthe project until this case has been resolved." According to Courthouse News, Hogan says in his lawsuitthat he pitched Red Bull an idea for a so-called "space dive" thatwould send a skydiver up to 130,000 feet (39,624 meters). Hogan reportedly lined up Lindstrand Technologies tobuild the balloon and pressure capsule, as well as a Russian company to design theskydiver's protective suit. A NASA flight surgeon rounded out the team, thelawsuit states. "Red Bull never acknowledged the plaintiff's role onRed Bull Stratos," the lawsuit says. In their Oct. 12 statement, Red Bull officials defendedthe company's past relationship with Hogan.? "Red Bull has acted appropriately in its priordealings with Mr. Hogan, and will demonstrate this as the case progresses,"company officials said. Baumgartner had planned to ride a custom-builtpressurized capsule carried by a giant helium balloon to his jump height. 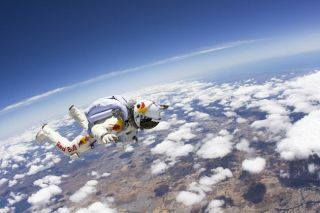 RedBull developed a sophisticated set of cameras for the skydiver to wear duringhis descent. In August, Baumgartner met with astronaut Neil Armstrong? the first human to walk on the moon ? and cosmonaut Alexi Alexei Leonov, thefirst person to walk in space, during an event for Armstrong's 80th birthday. "I find it interesting that we have fourfliers here, all of which are better known for getting out of something thanfor flying it," Armstrong said in a statement at the time. "We can'tall stay inside flying machines."